I have noticed a trend towards the triangle reticles since some red dots can look real fuzzy and one thing that Trijicon Red Dots don’t have are blur. 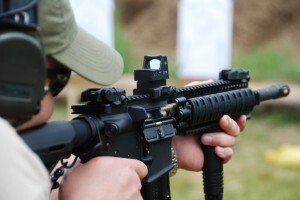 Clarity is something that Trijicon can alway praised about. Horeshoe reticles give you the ability to see through your aiming point and hold a target within the reticle as opposed to putting the red dot or crosshairs on the target. Sometimes this is a faster way of engaging a target and it was probable some of the Elcan optics that I shot with that I originally started seeing “hollow” reticles. If you have a triangle reticle like the Trijicon RMR08G, you can still have pin point precision by using the top of the triangle for your zero and holding the triangle over center mass. It pays to look through optics to see what you feel comfortable with, one down side to the ACOG models are the eye relief but the larger TA11’s tend to much more friendly. Either way, you might have to learn to adapt to the optic if you have a certain expectation from it. I am often learning how to use various optics because every manufacturer designs an optic a certain way, but so many people don’t read the manual or know the specs. Some of the Trijicon ACOGS are designed for 55gr flying out of a 20inch barrel, some people won’t know the difference but anyone shooting steel plates at a distance are going to notice it. The Trijicon TA01NSN is meant for an M4 with a 14.5 inch barrel with the 62gr SCBT round. There are always variations with those bullet velocity due to the quality of the manufacturer but if you shoot something like M193 or American Eagle 55gr you’ll do well with what your ACOG was traditionally designed for. If you know what your bullet is going to do at a certain distance you can always learn holder overs, but being able to do range estimations and fast shots isn’t going to be easy unless it’s designed into your reticle. Just like some people start off with a zero magnification optic like Aimponts and Eotechs, you can buy an ACOG and get the mount for an RMR at a later time. Like always, Trijicon RMR sights will cost you the same as most optics, but I can’t think of anyone that comes close with this dual platform.